The Afro-Punk tour arrived in Chicago with poet/actor/emcee Saul Williams leading the hip hop, punk and funk tribe to the Double Door. Openers American Fangs showed tons of passion and promise, but sadly the surly upstarts failed to strike any chords of freshness or uniqueness. But I feel for them, because having Saul Williams—-the personification of pure originality—-as your tour mate can make most bands seem average. When Williams marched on stage it was nothing short of dramatic. His “Niggy Tardust” persona—-the same character title of his 2007 concept album—-was in full bloom. Face covered in streaks of war paint, with an afro-mane sprouting aqua-colored feathers, it was a all a stunning visual reminder of his constant commitment to overcome the common struggle we all face: to funk the ordinary and embrace self-expression. Like his music, Williams’ stage presence combines the essence of hip hop, punk rock and funk all into one brilliant mix. 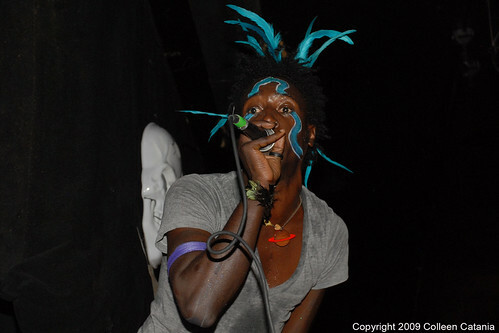 Intensity is the other crucial key to a Saul Williams show. His one-of-a-kind rawness and abandon for personal expression is awesome to watch and absorb. At previous shows, I’d felt invigorating psychological and physiological surges. But as this set unfolded something was missing. And we did. As soon as CX Kidtronix and company dropped the next beat the crowd surged. Heads bobbed, hands flung in the air, and hips swung in a current of riotous rhythms and gnashes of guitar blasting from the speakers. Williams was foreshadowing, however, because a few songs later he unveiled a new “still a demo” song from his upcoming album. He gripped the mic, crooning “Patience,” seething with soul and funky organ hums. The track sizzled with fear, heartache, and anxiety. Williams admitted that the song was not quite complete and thanked us for helping him get one step closer to finishing it. For just a demo, it was impressive. I can’t quite explain the show’s diminished vibe, but when Williams unleashed his trademark tracks “Black Stacey” and “Convict Colony” I was finally satiated with afro-punk. I’ll give him the benefit of the doubt this time, but next show I expect to leave wiped out and floating back to the seventh heaven.